Are environmental concerns keeping you from printing collateral materials for your company? If so, you may be missing out on a great opportunity of getting information about your company into the hands of potential customers and clients. Printed paper goods can be easier to read, won’t get deleted or scrolled past, can be accessed without a laptop or Wi-Fi connection, and can contribute to paper recycling. By relying solely on websites, social media and email for marketing, and not having physical brochures, letterhead, pamphlets, business cards and other materials to leave in-hand as a physical reminder to your prospects, you can be losing revenue opportunities for your company. The best printing companies, like Brumley Printing in Fort Worth, are a part of the solution to helping the environment and reducing the use of virgin paper products. Printing plates, paper, paper trimmings, and many other printing-related raw materials can and are recycled. Also, printers like Brumley Printing offer a plethora of recycled paper options for your printing projects. To be sure that your collateral materials are recycled after being utilized, you have the option to add “Please recycle this [brochure]” printed as a friendly reminder to your clients and customers to do their part in caring for the environment. Every ton of recycled paper saves 17 trees from being cut down. 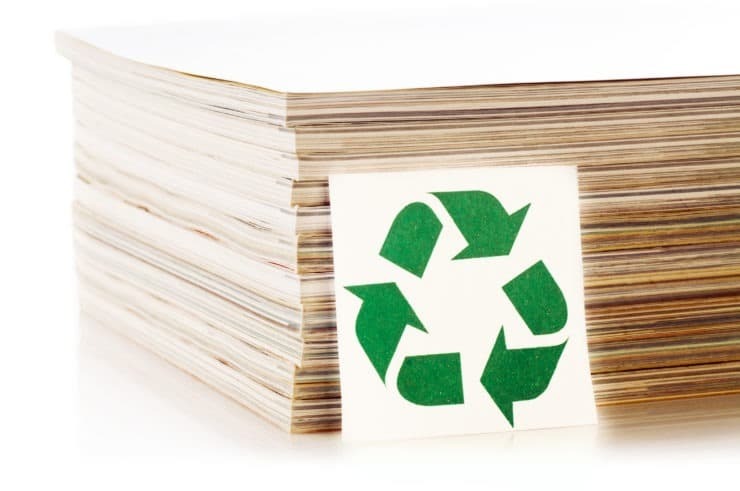 In 2011, 338 pounds of recycled paper was recovered for every person in the US. Now, with recycling efforts even more universal, that number is likely to be even more! For each ton of paper recycled, 1,000 gallons of water, 463 gallons of oil, and 4,000 electrical watts are saved. That’s a lot of resources that would have been consumed by the production of new paper! Recycling one ton of paper keeps 3.3 cubic yards of garbage out of landfills. CO2 emissions are reduced by about 3.6 million metric tons for each ton of paper that is recycled and not newly manufactured. When paper decomposes, methane gas is produced. If paper is recycled, and not put in landfills, methane gas emissions are reduced. Paper recycling also helps the economy. The recycling industry needs skilled workers. Over 1 million people work for the recycling industry. And that number is growing as demand for recycling and recycled goods continues to increase world-wide. Many recycling plant jobs pay above the national average wage. Some occupations include drivers, sorter, sales people, and engineers. Manufacturing and processing costs are reduced with the use of recycled materials, thus helping to keep consumer costs down, too. So go ahead and print your collateral materials! At Brumley Printing, one of the best print suppliers in Fort Worth, we will be happy to tell you about paper recycling efforts at our location, and help you select quality recycled papers for your project. For over 29 years, Brumley Printing has been providing small businesses in the Greater Fort Worth area with all of their printing needs. Call our office at (817) 336-5551 to experience our expert customer service and learn more about environmentally responsible printing solutions.